Vanity for a good cause: Police in Augusta want to know who has the best beard. AUGUSTA (NEWS CENTER Maine) — Police in Augusta may seem a little vain, asking Mainers to rate their manly good looks on social media, but it's vanity for a good cause. They are asking the public to weigh in on the scruffy matter of who had the best beard. Friday morning, officers from the Augusta Police Dept., who had been growing out their facial hair to raise money for charity during No Shave November, headed to a local barber for a nice, clean shave. Police are not normally permitted to have facial hair, but during the month of Thanksgiving, officers in Augusta raised $3,000 for charity by relaxing their look. Now 14 officers are vying for top beard bragging rights around their precinct. The officer that gets the most likes on Facebook will earn the title of best beard and be recognized at the police dept. 's annual holiday party. While being unbiased is a key ethic in journalism, we may be a little partial to Chief Jared Mills who not only grew out a thick beard but a ginger one at that. 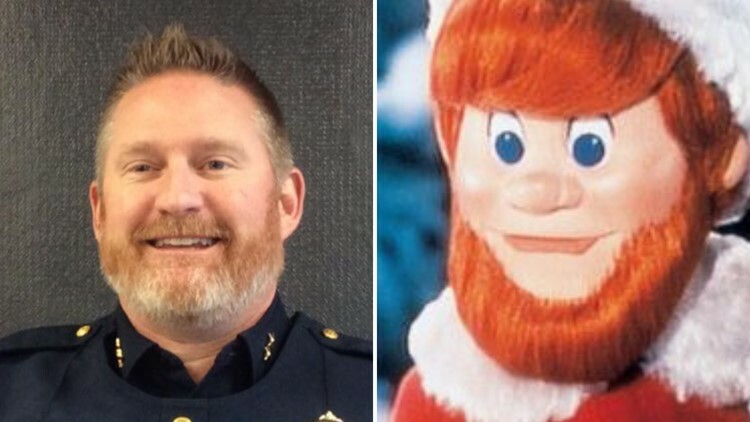 He reminds of us a young Kris Kringle and so has our vote!